Verses 1-4 : "The Spirit of the Lord God is upon me, because the Lord has anointed me to bring good news to the poor; he has sent me to bind up the brokenhearted, to proclaim liberty to the captives, and the opening of the prison to those who are bound; to proclaim the year of the Lord's favor, and the day of vengeance of our God; to comfort all who mourn; to grant to those who mourn in Zion— to give them a beautiful headdress instead of ashes, the oil of gladness instead of mourning, the garment of praise instead of a faint spirit; that they may be called oaks of righteousness, the planting of the Lord, that he may be glorified.They shall build up the ancient ruins; they shall raise up the former devastations; they shall repair the ruined cities, the devastations of many generations." We need your help to be able to continue serving this community of young people. Since LXI began, we have operated under budget. We have made due, but in many ways this can be a disservice to our mission. We have big plans and ideas on how we can better reach youth with the Gospel, but have been limited by a lack of funds. This is true now more than ever. As we enter into this season, we hope to be able to create new and engaging opportunities for leaders and youth to walk together in discipleship. Every penny will be spent to make a greater impact in the lives of the youth who call LXI Family! This looks like providing the resources for discipleship and outreach, fun activities, attending youth conferences, summer missions opportunities, sharing meals together, and support for Gretchen and I to continue to be local missionaries to at-risk youth. I want to assure you that we are called here as we are devoting our lives to seeing a broken generation be made new. We are praying that God would make Isaiah 61:1-4 a reality in these kids’ lives. We have faith that, despite the circumstances stacked against them, God will change their hearts and use their lives to make a difference in the communities they live in! Will you consider joining us in faith by supporting us financially? Through your support we can continue to bring healing into broken families. Now more than ever our city is broken and needs people willing to step into the darkness with the light of Christ. We firmly believe that God will restore these young people and their families to be the next generation of teachers, mechanics, marketplace leaders, church leaders, and most importantly moms and dads who show the unconditional love of God! We see the need, and want to live our lives on this mission. Join us on this mission field! Through your support we can continue this work of restoring youth in our city! Johnson City, TN 37605 Checks written to "LXI"
As 2016 comes to a close, we want to take some time to pause and look back at some of the big moments we experienced this year. These experiences represent daily relationships and a community we call family. Behind these mountain-top-experiences are simple moments of love, hardship, grace, forgiveness, and faithfulness that happen each day. They are pictures that tell of God working in the hearts and lives of people. Volunteers and leaders spent a retreat weekend at Doe River Gorge to refresh and recharge as a community. Twelve youth leaders were a part of a youth discipleship weekend called Impact where they were challenged to step out with bold faith in their schools and communities. Youth worked out together with the Crossfit East10 youth program. High school boys and middle school girls were discipled through LXI basketball and soccer rec teams! The boys’ basketball team finished in first place! Three college interns served with LXI during the summer, building relationships with and pouring into the lives of youth. 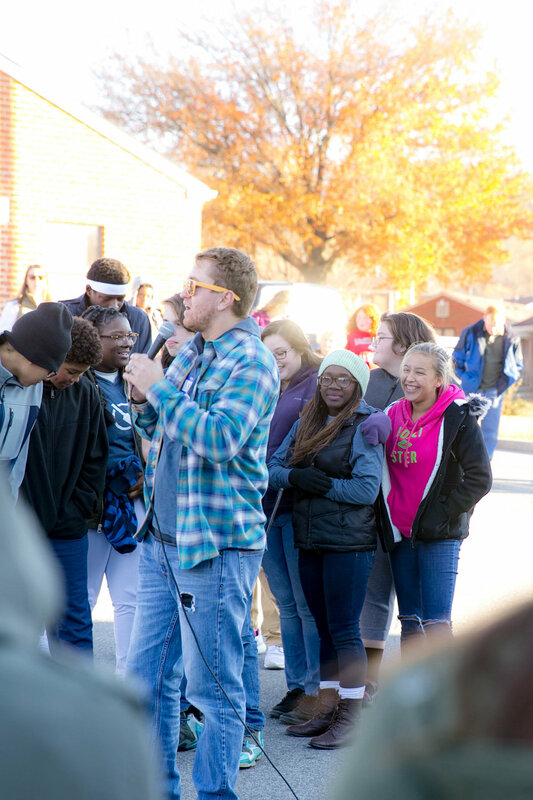 Youth leaders stepped into weekly opportunities to serve in their local community. Adventure, community, and spiritual growth were found as fourteen youth experienced a week of camp at Doe River Gorge. We took seventeen youth leaders on a mission trip to serve in both the suburbs and the inner city of Philadelphia. Both worldviews and hearts were changed! Doe River Gorge DayQuest with fifty LXI youth! Amplify grew to over 100 people each Tuesday night, including twenty new youth who had never before heard the Gospel. Youth and leaders experienced God in worship for a night with United Pursuit in Knoxville. Our youth leaders took ownership of LXI in huge ways! The culmination was a youth “take-over” of Amplify, where they planned, prepared, and led the entire night. Keystone neighbors and local churches came together for our sixth annual community Thanksgiving dinner! Adventured to Bristol Motor Speedway for a night of Christmas fun with twenty LXI youth and volunteers. Over this past year, God has taught us to depend on Him. He has shown us that the work of changing hearts is His alone. In the daily ups and downs of ministry, it is so comforting to know that we serve the Creator, Savior, and Redeemer of the world! We are so thankful for God’s faithfulness to us over this past year and look forward to His continued faithfulness to change hearts and lives through His Son, Jesus Christ.